QBITS MegaProfit System by Jeremy Hart claims that it can help you make thousands of dollars a day, but don’t be fooled. It’s just a generic binary trading software scam. I’ve collected everything you need to know about QBITS MegaProfit System scam in this review, so make sure you read it before committing yourself into a financial headache. 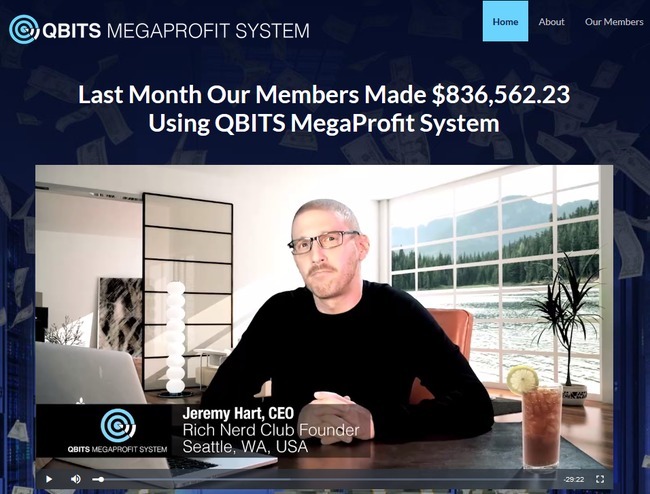 The alleged CEO of QBITS MegaProfit software, Jeremy Hart promises to make you thousands of dollars a day just by signing up for his “free” system. Even though it is advertised as free and “no credit cards required”, there are actually some hidden caveats that Jeremy conveniently left out. QBITS MegaProfit System doesn’t come free. You have to deposit at least $250 to activate the software, and this is where they make money off you. Long story short, don’t expect to see your money back once you deposit it into your trading account. My readers have lost all their funds in quick succession after activating the app. Unfortunately, there is nothing much the victim can do once the funds have been lost. It’s considered trading loss and is unrecoverable. I’ve collected some evidence to prove that QBITS MegaProfit is a scam, so let’s learn a thing or two that may help you spot future scams. Within the sales video, Jeremy Hart showed some bank statements and claimed that he made those profits using QBITS MegaProfit System. The statement was shown to be accurate as of 08/15/2015, with a pie chart showing the allocation of assets on the left. If you look closely, you’ll realize that the date on the pie chart shows 08/15/2005, a 10 years difference than what is shown on the right. 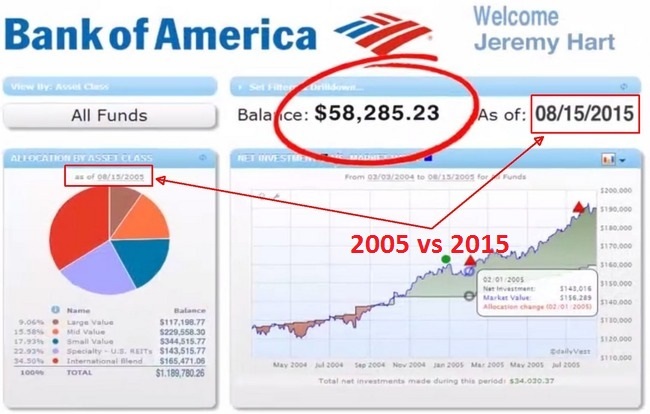 Now take a closer look at the words “Jeremy Hart”, the balance amount “$58.285.23” and the date “08/15/2015”. Did you realize that the fonts don’t fit the rest of the screenshot? 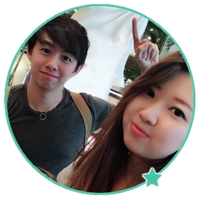 Apparently, the screenshot was edited by the scammers behind QBITS MegaProfit app to deceive their victims. The difference in dates was a careless mistake that they forgot to edit. These details are hard to spot, but they are essential red flags that often warn us about scams. Due to the large number of fake member testimonials used in online scams, I always perform a background check on the members for every online opportunity. QBITS MegaProfit is no exception, and I started by checking the background of Martin Brent (screenshot above), who claims to have achieved amazing results with the software. Since the only identifiable information was his profile picture, I started my research by doing a reverse image search using the photo of Martin Brent. Unsurprisingly, I found the origin of the photo to be from 123rf.com, a stock photo vendor website that sells all sorts of royalty-free images. Stock photos are basically professional photographs that anyone can buy from the vendor website for advertisement purposes. 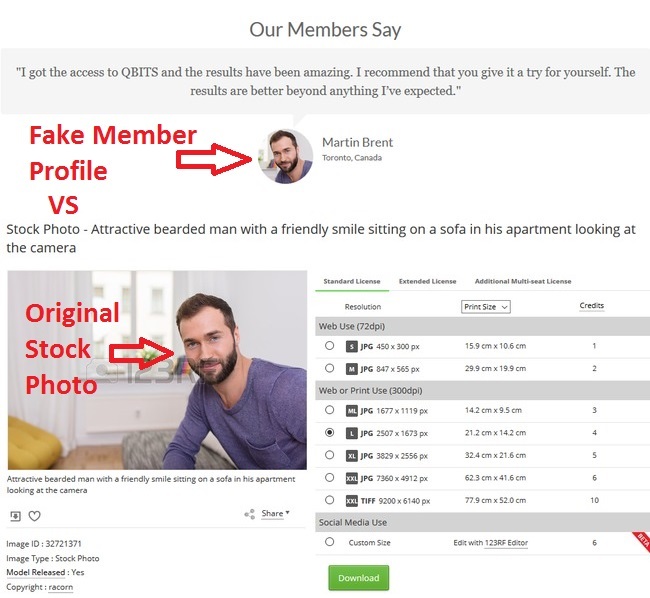 Apparently the scammers behind QBITS MegaProfit System cropped the stock photo and fabricated an identity for him, pretending to be a real member. Don’t be deceived by this common scam tactic. No one is making money with the software, as evidenced by the huge losses of my readers. Besides, if there are real members who are satisfied with the performance of the software, QBITS MegaProfit System wouldn’t have to fabricate fake members to promote the scam. As much as Jeremy Hart and QBITS scam want to keep you in the dark, they have to reveal the true nature of the scam somewhere within the website to protect themselves from lawsuits. They chose to hide the truth deep within the disclaimer document. You won’t find the document anywhere in the sales material, because it’s supposed to be hidden from you. Check out the original disclaimer on their own website at qbitsmegaprofit.co/disclaimer. The portion quoted above is on the left side. The possibility exists that you could sustain a total loss of initial margin fund and be required to deposit additional funds to maintain your position. QBITS MegaProfit does not guarantee or represent that members acting upon any suggestion mentioned or discussed in any of the services we offer, will result in profit. QBITS MegaProfit will not be held responsible or liable to members or any other parties for losses that may be sustained while trading. Despite guaranteeing your profits, the reality is that you may lose your initial deposit and be required to top up more funds just to keep trading. My readers have all received margin calls from brokers pressuring them to top up their empty trading accounts. Again, despite guaranteeing your profits, QBITS MegaProfit admits that they do not guarantee members to achieve any profit using their software. Most importantly, you are on your own if you lose all your money. QBITS MegaProfit is not responsible for your losses. 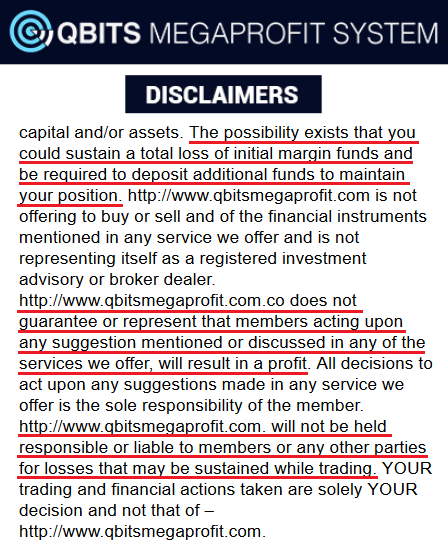 If you lose all your investments and decide to sue the scammers behind QBITS MegaProfit, this risk disclaimer will protect the scammers from lawsuits. If you decide to sign up for QBITS MegaProfit system, you will be required to open a new broker account with their partner brokers, which are unregulated by monetary authorities. The losses are pocketed by the broker, which is then shared with its partner-in-crime – the scammers behind QBITS MegaProfit system. QBIT MEGAPROFIT SYSTEM IS A SCAM. I strongly advise you to stay away from the scam if you don’t want to lose your hard-earned money. I really wish I found this review earlier. I didn’t suspect anything until it was too late – my $500 strong account dwindled down to $130 after 1 day. Can I recover what’s left in it? Hi Brenda, stop the autotrading feature immediately and request a withdrawal of your remaining funds. You should be able to withdraw them, it’s your money after all.